With the passing of the 62nd Primetime Emmy Awards, it wouldn’t be right if SheKnows didn’t acknowledge Jimmy Fallon for his upbeat and refreshing take on hosting TV’s biggest night. Jimmy Fallon was a bold choice to host the Primetime Emmy Awards — bold in writing and bold in presentation. But after Fallon’s witty and interactive appeal, it was a move that paid off quite well. This was a top five moment because nothing says passing the torch like a zinger from last year’s mock-jaded emcee. Nothing says Jimmy Fallon like physical comedy. Add Jane Lynch to the mix and you have a killer bit. During the opening number Jimmy Fallon tried to put together a glee club full of celebrities in a Glee spoof. Jane Lynch pulled out the Sue Sylvester tracksuit and let Fallon have it with a good old slushy to the tuxedo. A cherry red slushy to the tux via Glee is hysterical. Way to take one for the team, Jimmy Fallon. Now, the statement that Jimmy Fallon goes interactive does not refer to just one moment. This pays homage to the entire effort Jimmy Fallon put forth in his writing and hosting responsibilities. Fallon used Twitter to challenge home viewers to tweet the presenter’s intros, which was a unique idea and stellar way to tap into a fresh new avenue. 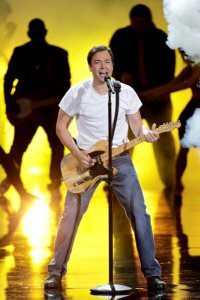 Fallon also brought out his trusty acoustic guitar and partnered with A-list actors to create musical parodies for the five categories of television. His efforts provided an interactive evening to rival the past and usher in the future of hosting. Jimmy Fallon used his musical stylings to say goodbye to three shows not returning. 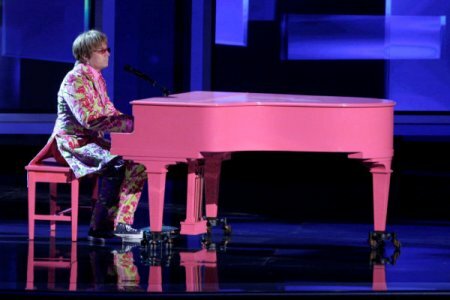 The funnyman, dressed as Elton John, tickled the ivory keys and sang out a parody of Candle in the Wind, bidding a fond farewell to 24. With a quick change, Fallon morphed into a Boyz 2 Men member proving it’s so hard to say goodbye to Law and Order. “The good crimes and changing cast” were clearly on his mind. Next, the comedian had the time of his life in mock Green Day garb. He sang, “I didn’t understand it but I tried” to Green Day’s Time of Your Life, while paying tribute to Lost. Glee is the breakout show of the year and of course Jimmy Fallon had to spoof it. What better way to do it than in the opener? Fallon, along with the cast of Glee, was tasked with finding more members to put in their glee club. Why? They had to raise money to get to the Primetime Emmys. Tina Fey, Jon Hamm, Betty White, and Jane Lynch rallied around Fallon as their leader, who led them down the halls gleeking out to Bruce Springsteen’s Born to Run. The dynamic spoof by Fallon was not only funny, but mirrored Glee so much that it actually also played off as serious. Jimmy Fallon said he asked Hollywood actors for help with the opener and they did not fail him, and Jimmy did not fail us in the number one Fallon moment. What was your favorite Fallon moment? SheKnows wants to know.